Hubert Horatio Humphrey came to Philadelphia in January of 1972 to announce his candidacy for the office of President. That night he addressed an AFL-CIO convention at the Bellevue Stratford Hotel on Broad Street and I was there. How I knew Hubert wore boxers and not “tighty-whiteys” is a tale that begins a couple of years earlier in the newsroom at WCAU-TV. Not long after I started at Channel 10 in Philadelphia, my boss, Barry Nemcoff, noted that I had been a management trainee at CBS in New York the summer before while still a college student. Among the skills I learned was PERT – Project Evaluation Review Technique – a US Navy management tool developed to oversee the original Polaris Nuclear Missile Submarine project. He asked me to use PERT to solve the consistent problems of getting our 6 PM hour long newscast together. And when I completed my study, he made me the producer of that same program. PERT allowed me to completely design the entire hour long program by 1 PM in the afternoon. Oh, yes – if news occurred after that I’d have to scramble to fit it in, but it worked. And I was bored. I missed reporting. And I discovered, that no one in Philadelphia really covered news for television or radio after 5 PM. TV stations were all still using film. This was years before satellite and portable television news cameras. So to make it on the air, a news story’s film needed to be in the film processing machine in our basement by 3:30 PM. I asked the radio news director at WCAU-AM if there was a way I could cover stories. And what I learned was that among its network of hundreds of stations, CBS set up a freelance news network of 8 radio stations around the country where freelancers could feed stories and get paid $25 each time a story aired on any of those stations. Soon, I was to be heard in Washington, Boston, New York, Chicago, St. Louis, Los Angeles, San Francisco, as well as Philadelphia. Generally, I would find stories on my own and create features that could run for several days. Union rules prevented me from covering any planned and pre-announced events. But I could go to these events and attempt to speak to key newsmakers beforehand to get around the union rules. And that was the case with Hubert Humphrey. The former vice president fresh from his return to the senate in Minnesota and hungry to capture the democratic nomination for president after his narrow loss to Richard Nixon in 1968, was a favorite of organized labor. So it was appropriate that on the day he announced his candidacy he would speak to an AFL-CIO dinner at the Bellevue – a dinner I couldn’t cover because it was a pre-planned event. Ever the enterprising reporter, I discovered the suite of rooms he was using at the Bellevue and knocked on the door. When it opened, I was facing a room full of donors and supporters – key leaders in the Philadelphia business community. I knew a few of them. One – S. Harrison “Sonny” Dogole – owner of the nationwide detective agency, Globe Securities Systems, based in Philadelphia. He was also a member of the synagogue I attended and he welcomed me in. When I explained I couldn’t record Hubert’s speech later that evening, he knocked on the door to Hubert’s room. Muriel, that is, Mrs. Humphrey, opened the door and Sonny told her I was from CBS but was unable to attend the event. She said she’d see what she could do. And moments later she opened the door and invited me in. Hubert Horatio Humphrey, the 38th vice president of the United Sates and now the junior senator from Minnesota, was standing in the bathroom – his face covered in shaving cream. He was in a white undershirt and tan boxers. With a huge smile he asked me to join him while he shaved. I explained my problem. He told me to turn on my recorder and he began repeating key parts of his speech in response to questions. Later that night a prophecy was fulfilled. 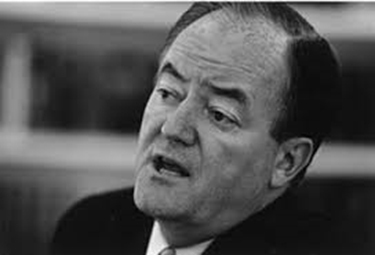 In 1958, My PS 188 4th grade teacher, Mrs. O’Brien, wrote in my elementary school graduation book that my “…oratory would be heard in Washington.” It was heard that night when WTOP radio in Washington, DC ran my story and the Hubert Humphrey interview.